Louisiana Fit Kids is proud to promote our statewide partners that support a Healthier Louisiana! Eat Move Grow is a federally funded organization that offers a wide variety of engaging programs to children, families and schools in rural, underserved elementary schools and communities across Southeast Louisiana. 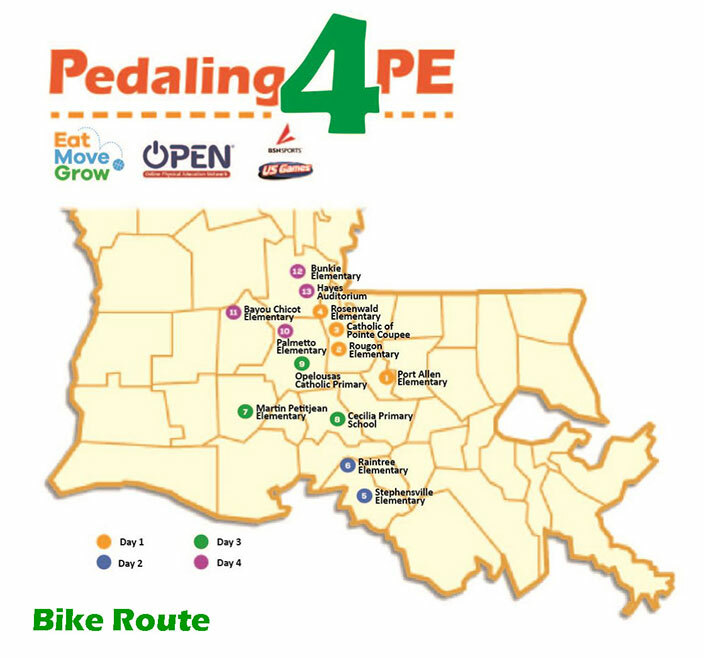 To promote physical education in Louisiana’s rural school areas, EatMoveGrow and US Games (a company that partners with organizations to promote growth and sustainability of highly effective physical education programs) will co-sponsor the Pedaling 4 PE bike event. This event encourages cyclists and lovers of physical education to join in on promoting PE. Pedaling 4 PE consists of bicycling 377 miles in 4 days to celebrate OPEN (The Online Physical Education Network, which is a free physical education curriculum developed by experts as a philanthropic out-reach program). The cyclists begin their ride at Port Allen Elementary Monday, December 11 and end Thursday, December 14 in Avoyelles Parish. Cyclists will stop at 12 schools and students will be treated to an OPEN lesson taught by a national OPEN trainer. Schools will also receive US Games PE equipment packs. Other partners include the Louisiana Agriculture Extension, American Heart Association, DOW Chemical and Action for Health Kids. Interested in riding or participating? Register for Pedaling 4 PE.